In their third and final estimate of the US GDP for the second quarter of 2017, the Bureau of Economic Analysis (BEA) reported that the US economy was growing at a +3.06% annual rate, up +0.02% from their previous estimate and up +1.82% from the prior quarter. The changes from the previous estimate are little more than statistical noise. For example, consumer spending was revised downward -0.03% to a +2.24% annualized growth rate. The inventory contribution continued to be essentially neutral (+0.12), while the previous growth in commercial fixed investment moderated slightly (to +0.53%). Governmental spending remained in a very minor contraction (-0.03%), and the growth rates for both exports (+0.42%) and imports (-0.22%) were fine tuned modestly. 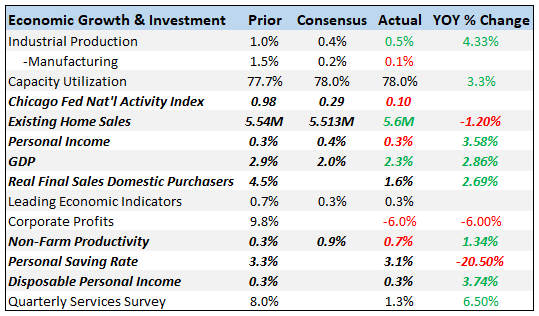 The BEA's "bottom line" (their "Real Final Sales of Domestic Product", which excludes inventories) was revised downward to +2.94%, still up +0.24% from the prior quarter. Real annualized household disposable income was revised upward $7 to $39,299 (in 2009 dollars). The household savings rate was revised upward by +0.1% to 3.8% (down -0.1% from the prior quarter). For this revision the BEA assumed an effective annualized deflator of 1.01%. During the same quarter (April 2017 through June 2017) the inflation recorded by the Bureau of Labor Statistics (BLS) in their CPI-U index was a minuscule 0.06%. Over estimating inflation results in pessimistic growth rates, and if the BEA's "nominal" data was deflated using CPI-U inflation information the headline growth number would have been materially higher at a very healthy +4.04% annualized growth rate. The headline contribution from consumer expenditures for goods was reported to be +1.16% (up +1.01% from the prior quarter). The contribution to the headline from consumer spending on services strengthened to +1.08% (although that remained down -0.09% from the prior quarter). The combined consumer contribution to the headline number was +2.24%, up +0.92% from 1Q-2017. The headline contribution from commercial private fixed investments was revised downward to +0.53%, down a material -0.74% from the prior quarter. That continued to reflect a contraction in residential construction. Inventory continued to be very nearly neutral (at +0.10%). This was a +1.58% improvement from the prior quarter. It is important to remember that the BEA's inventory numbers are exceptionally noisy (and susceptible to significant distortions/anomalies caused by commodity price or currency swings) while ultimately representing a zero reverting (and long-term essentially zero-sum) series. Governmental spending was reported to be contracting very slightly, at a -0.03% rate. This was a +0.08% improvement from the prior quarter. Exports contributed +0.42% to the headline number, down -0.43% from the prior quarter. Imports deducted -0.22% from the headline, which was up +0.41% from the prior quarter. In aggregate, foreign trade added +0.20% to the headline number. The "real final sales of domestic product" grew at an annualized 2.94%, up +0.24% from the prior quarter. This is the BEA's "bottom line" measurement of the economy and it excludes the inventory data. As mentioned above, real per-capita annual disposable income was revised upward slightly (by $7 per annum). At the same time, the household savings rate was reported to have increased +0.1% (although it is down -0.1% from the prior quarter). It is important to keep this line item in perspective: real per-capita annual disposable income is up only +7.15% in aggregate since the second quarter of 2008 -- a meager annualized +0.77% growth rate over the past 36 quarters. Consumer spending provided 2.24% to the headline number, more than two thirds of the total growth and 69% of the total GDP. Commercial fixed investment was revised downward modestly to +0.53%, while there continued to be a contraction in residential construction. Exports and Imports continue to provide a net positive (+0.20%) contribution to the headline number. During the second quarter consumer spending was what might be considered "normal" for a healthy economy. Hopefully next month's preliminary reading for the third quarter continues that trend. Previous Brexit: Will It Ever Happen?